Over the last couple of years I have been posting under the banner “View From The Conservatory”. I thought it was probably time I showed you where my observations originated from. My main reason for this is the fact that we are knocking it down. To be replaced with a new bright shiny one. This structure was built around twenty-five years ago. The company that built it had not, so we found out later, done a very good job. Unfortunately, they also went bust before it was completed. The build was completed under the supervision of the “Official Receiver” and needless to say the “10 year warranty” never materialised. 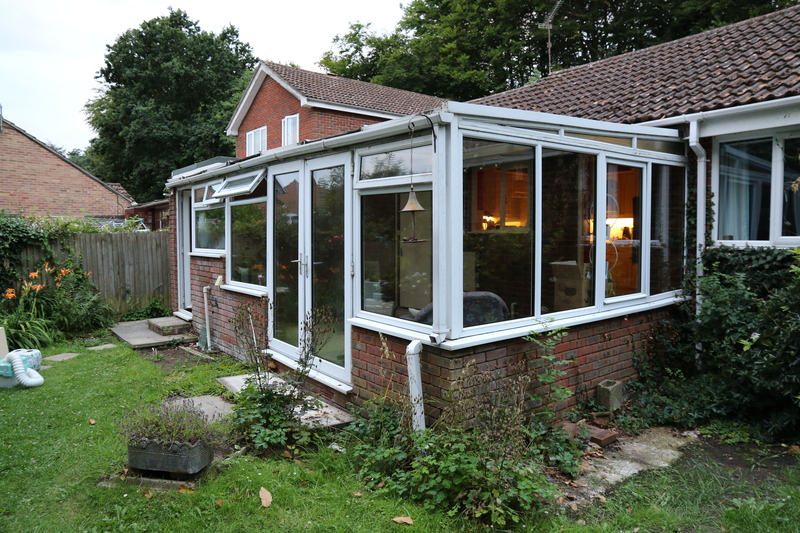 Over the following twenty-five years the conservatory has been slowly falling down, due to the poor preparation of the ground and subsidence of the footings. The conservatory has been slowly trying to pull away from our house and worse, one corner in particular, has been dropping presumably due to the clay base of the soil. Needless to say we also suffered leaks, sometimes emulating waterfalls, and draughts. The photo above is the last view of the inside with all the carpets and most of the furniture removed. The patchwork on the floor is as a result of my trying to level the floor. You can just see that the two doors are out of alignment if you look at the handles and to the left you can just see the ivy which is constantly trying to invade. The doors haven’t, until a couple of weeks ago, been opened for something like three years. Primarily because they were such a job to close again. Also, I had stuck gaffer tape all round the frames to cut down the draughts coming through the gaps. The seals were so out of alignment I could get my fingers through to the outside world. Anyway, that is all in the past, as the next photos show. 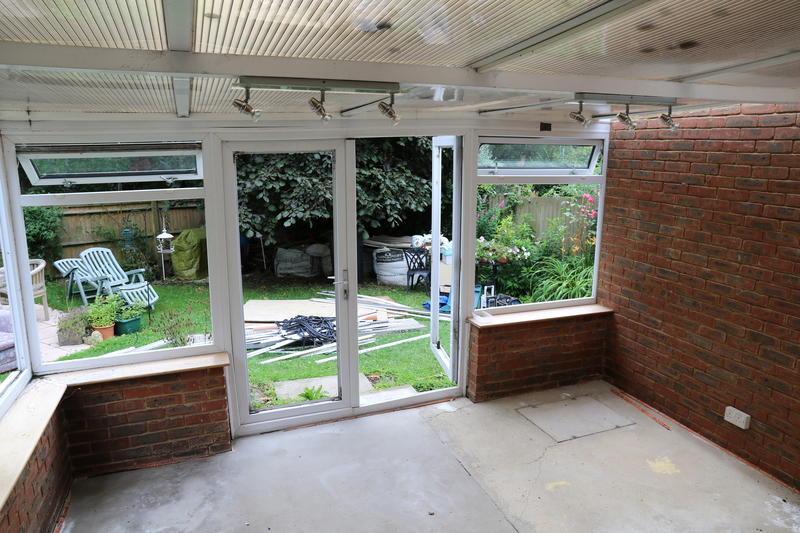 Conservatory – No Frames, Just the partition wall. 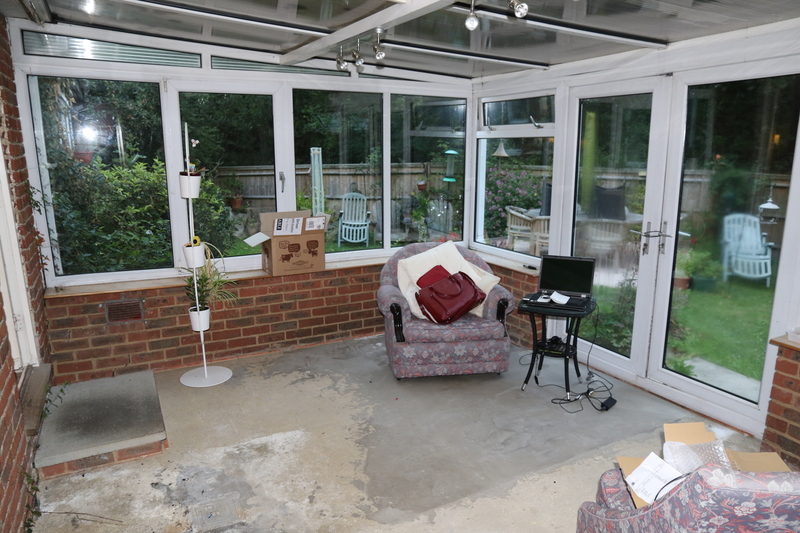 Conservatory – No Frames, partition wall has gone. 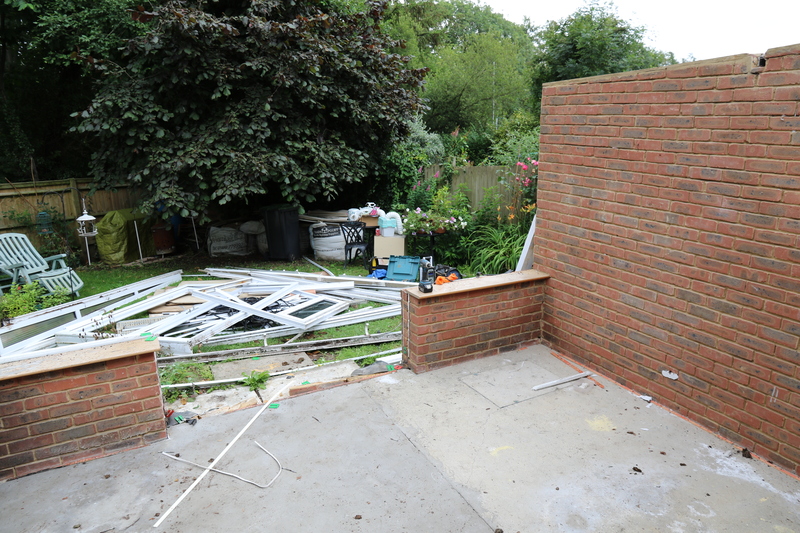 Apparrently, halfway through the build, the original bricklayers decided to lay the bricks upside down i.e. frog side down !!! 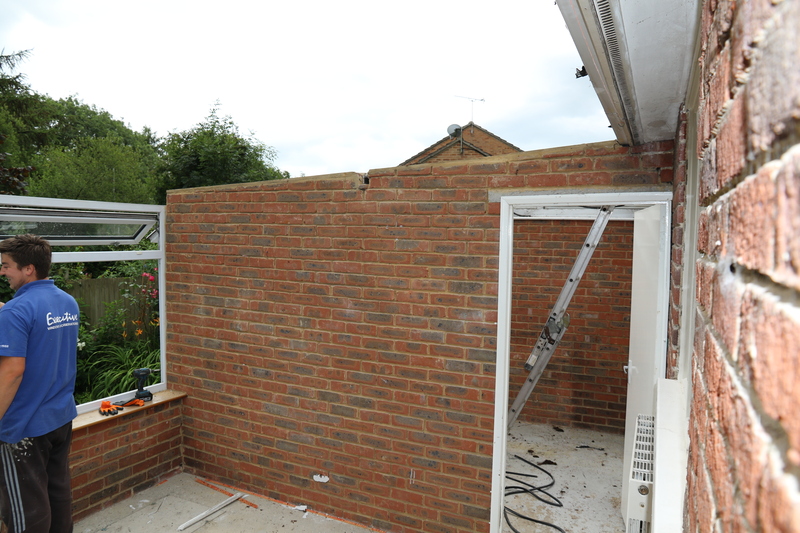 Conservatory – End of Day 1 – All gone barring the end cavity wall. Tasks for day two – knock down the remaining end wall, start exploring existing footings to see if they can stay or if the whole existing base has to come up. 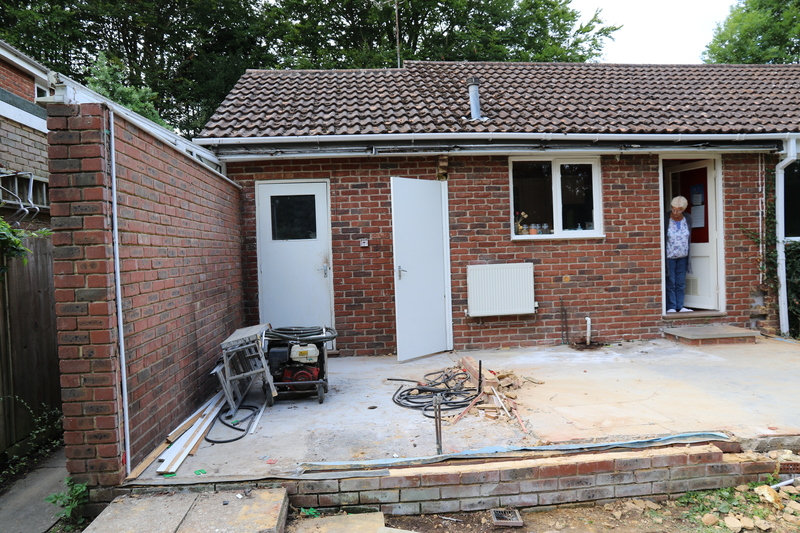 Either way new strengthening and stabilising footings have to be created before any new build can be started. This entry was posted in Local (To Me !!!) and tagged conservatory, demolition, draughts, Executive, gaffer tape, leaks, Windows. Bookmark the permalink. Thank you. Yes we hope the end result is worth it too. 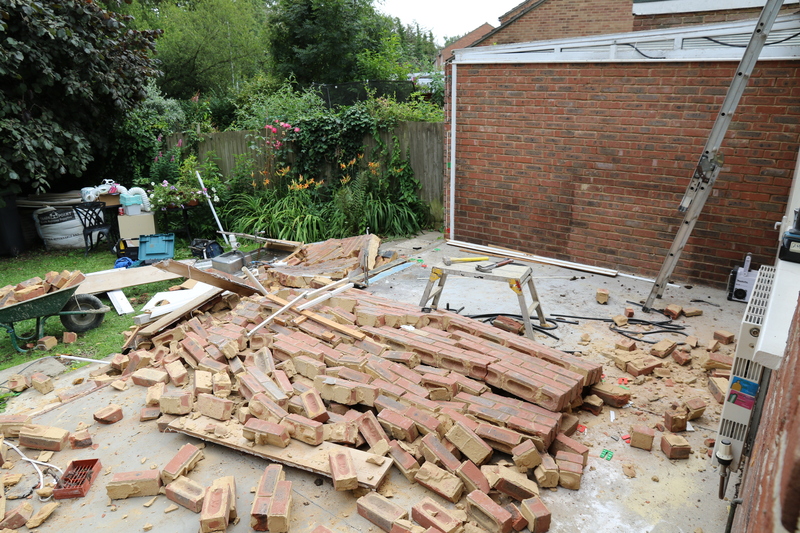 Our contractors have been in business for over 25 years so, fingers crossed, they will do the job properly this time.